When my family first started our natural living journey, we didn’t have the financial means to purchase lots of different products and ingredients. Money was definitely tight as a single income family. In an effort to maintain both my mental sanity and our financial stability, I had to figure out how to make the switch from toxic products to more natural options. My solution was a simple one: Embrace this makeover as a journey. A slow, steady journey; swapping one product at a time. I personally believe the best products to start with are the ones most often used. For me, this meant first swapping my daily face cleanser, toner, moisturizer, body soap, toothpaste, all-purpose cleaner, dish soap, and eventually makeup for more natural options.Slowly, as my old (toxic) products ran out, I would search for replacements. 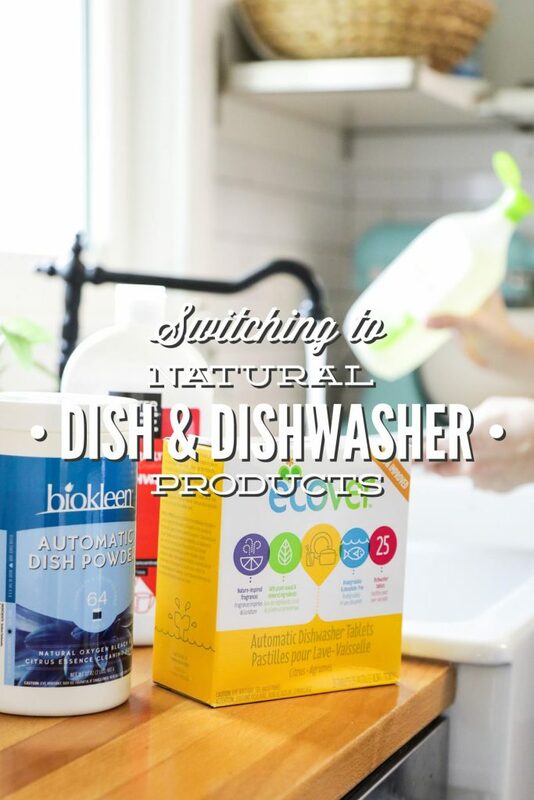 A few years ago, this process was difficult, since there weren’t a lot of options for “more natural” products like dishwasher soap, laundry soap, makeup, etc. This meant that I had to come up with homemade solutions for some of these products. I’ve shared many of these solutions here on the blog, in my cleaning book, and will be sharing more in my upcoming body book (Natural Body Care Simplified, coming December 2017). When I first started this journey, I wanted someone to walk alongside me. Someone who had walked the same path I was currently traveling down. Someone who could come alongside me and say, “Hey, you’re looking for a more natural replacement for ______? Cool! Here’s what I’ve tried and loved.” My desire is to be that someone for you. And I would love if you would also be that someone for me. Together, we can share about the swaps we’re making, what we’ve tried, and the products we’re using and loving. This is the first post in a monthly series called, Switching to Natural Products. Each month I’ll round up some of the products I’ve tested and enjoyed using in a particular category. Some of the categories will be home-based and others will relate to body care. 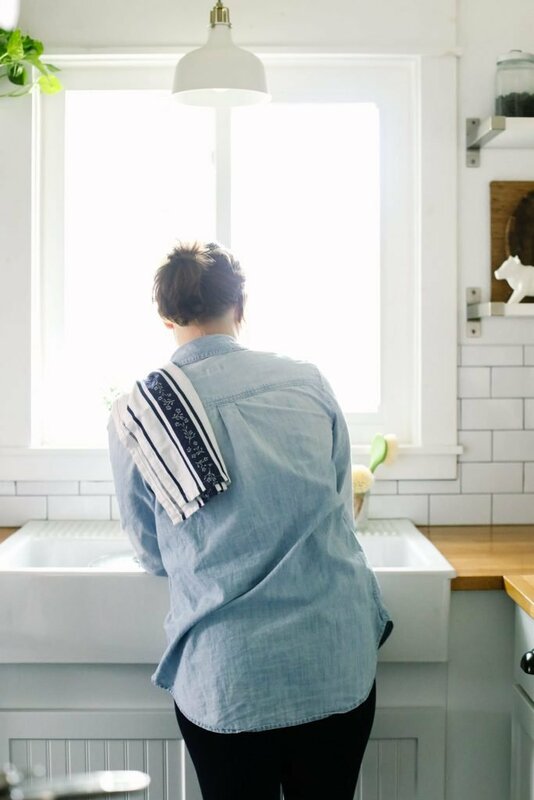 First up, let’s talk about cleaning the dishes. We all have them, and we all need some sort of soap to get them clean. 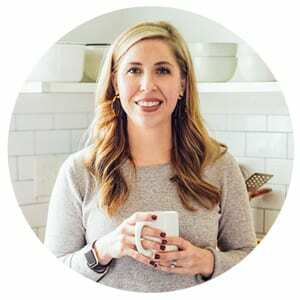 Today, I’m going to share my favorite products, based on what I’ve tried. This isn’t an exhaustive list of every option available. If I try new products in the future, I’ll be sure to update this list. I’ve provided some information about where to source each product, along with the Environmental Working Group’s rating for the product. You’ll notice that most brands make both fragrance-free and scented versions of the same product. The fragrance-free options almost always receive a better/cleaner score from the EWG. 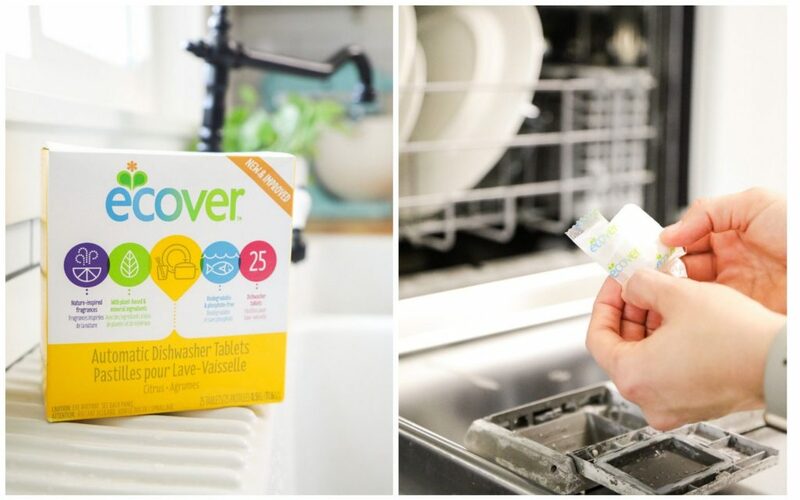 Ecover makes several good cleaning products, including an automatic dishwasher tablet. The tablets are available at most health food stores (including whole Foods) and online. One box, containing 25 tablets, costs roughly $6-8. Environmental Working Group Score: B, due to fragrance (citrus, yellow box). There’s also a fragrance-free option (blue box). 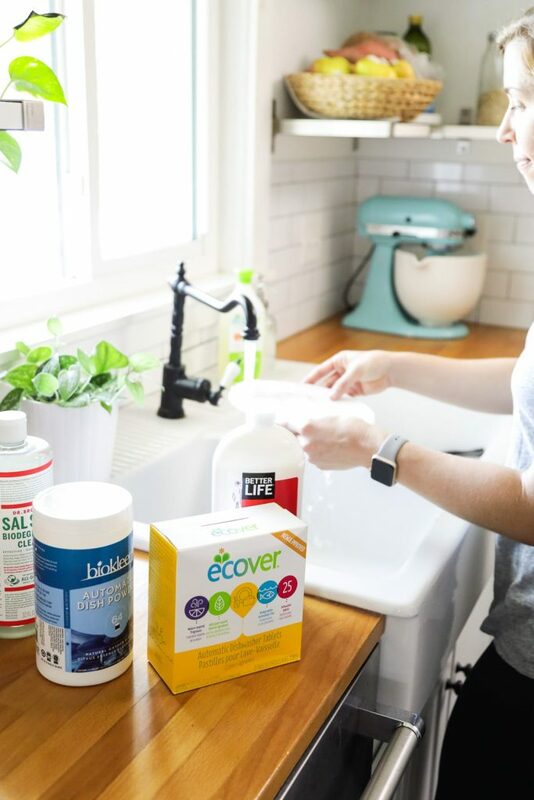 Seventh Generation products are sold even in conventional grocery stores, so if you’re looking to make a switch today (and don’t have a health food store in your area or a desire to order online) this is a good option. The powder soap is wrapped in a seal, which makes the packs easy to use–just like a tablet. One package, containing 45 packs, costs roughly $9. I haven’t used this dishwasher powder in a while (I prefer a tablet option). When I needed the product for the photos in this post, I went to Amazon, found the product, and clicked the purchase button. I didn’t realize that I accidentally purchased the citrus-scented powder versus the fragrance-free (Free & Clear) option. The scented version receives a C from the Environmental Working Group. The fragrance-free option receives an A. Both containers are blue and white, so make sure you look for the words “Free & Clear” on the label. This option can be found at some health food stores and online. A 32-ounce container costs roughly $13. 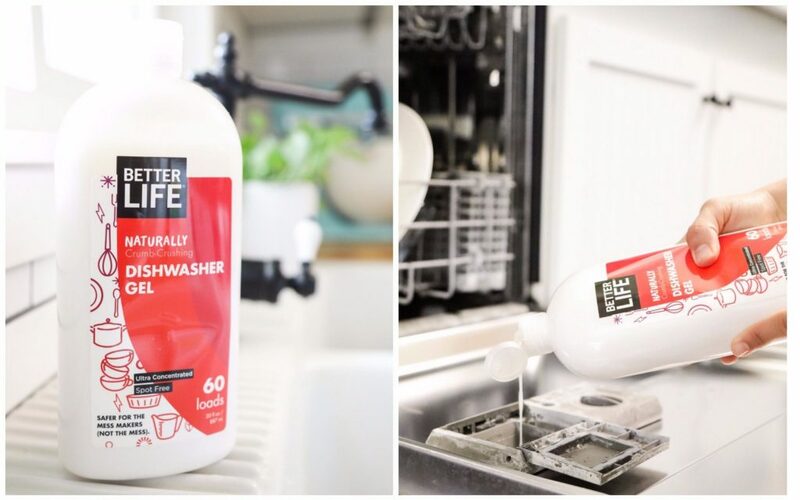 I discovered this company while searching for natural dishwasher gel options on Amazon, and I was impressed with the A rating from the EWG. We tend to stay away from dishwasher gel (Dustin doesn’t think it works very well), but this one was impressive. It actually worked, even with our hard water. The gel is sold online, and possibly in some health food stores. A 30-ounce bottle costs roughly $11. The key ingredient in this do-it-yourself option is Sal Suds, castile soap’s super strong brother. Castile soap doesn’t provide enough grease-fighting power (in my opinion) to make a good dish soap, so Sal Suds is a great alternative. Sal Suds is highly concentrated so it needs to be diluted. All you need to add is water, and I also like to add a bit of vinegar to help with the rinse and shine. A 32-ounce bottle of Sal Suds costs roughly $13. As mentioned before, Ecover may be found at most health food stores, including Whole Foods. I’ve found that a lot of “more natural” brands are only available online, which is great if you have time to order a product, but it’s also nice to have an in-store option. One 25-ounce bottle costs roughly $4. I’d love to hear from you in the comment section. Tell me what you’re working on swapping in your home, what you’ve already swapped, what you want to swap in the future, and any products you particularly love (or don’t love). Seventh Generation unscented dish soap is my favorite for hand washing. It’s the only unscented that is truly unscented. So many still have a scent to them. I also like the Seventh Generation dish (and auto-dish) soap. It seems to work better than some of the other natural brands I’ve tried (haven’t tried Ecover yet). 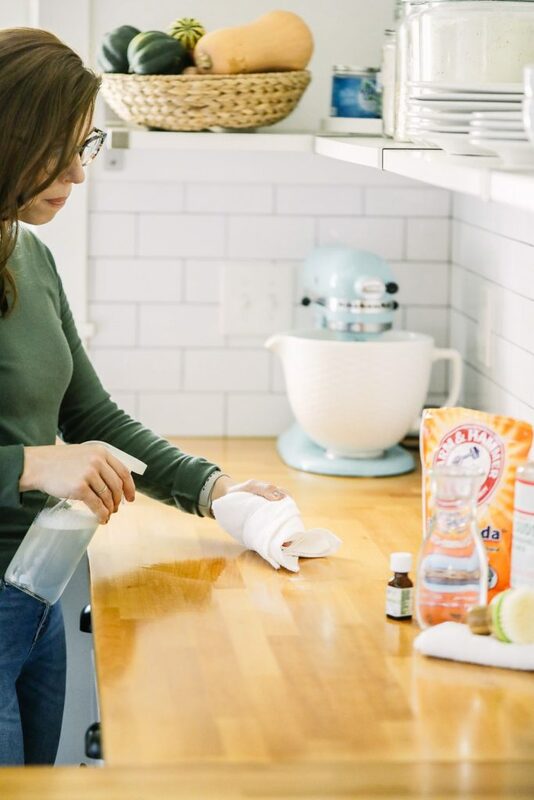 I made your recipe for Sal Suds dish soap and I love it! But I think I have to abandon it as it ate my hands so bad I’m covered in band aids from cracking skin, even after adding nourishing oils and some aloe. Oh no, Tamara. It can definitely dry out your hands. If you make it again, you may want to wear gloves or reduce the amount of Sal Suds even more. Seventh Generation is a good one. Oh yes, I always wear gloves! It helps me use hotter water too LOL because my hands are insulated. My favorite are the Mr Clean Bliss. I buy them at Menards or Staples. Any others I have tried do not last long. I’ve always hated wearing gloves, taking them on and off is a pain, but I definitely need to start doing it. Thank you for the recommendation! I’ll try those out. The Better Than Life dish soap is the best dish soap I have ever used! Better than any conventional … breaks through greasy residue and doesn’t dry your hands out! I’m glad to hear that the dish washing gel works because I have been wanting to order it. That’s good to know, Leigh. I haven’t tried their dish soap yet. OMG – you are the first person I’ve ever found that also likes the Ecover lime dish soap. The smell is the best I have ever experienced in a dish soap. It calms me and smells so so natural. And of course it works just as well as anything else in my opinion. Ecover is one of very few natural cleaning brands/products in Germany. I like and use their laundry soap. That’s awesome, Teresa! I had no idea they were available internationally. Thanks so much for your recommendations! 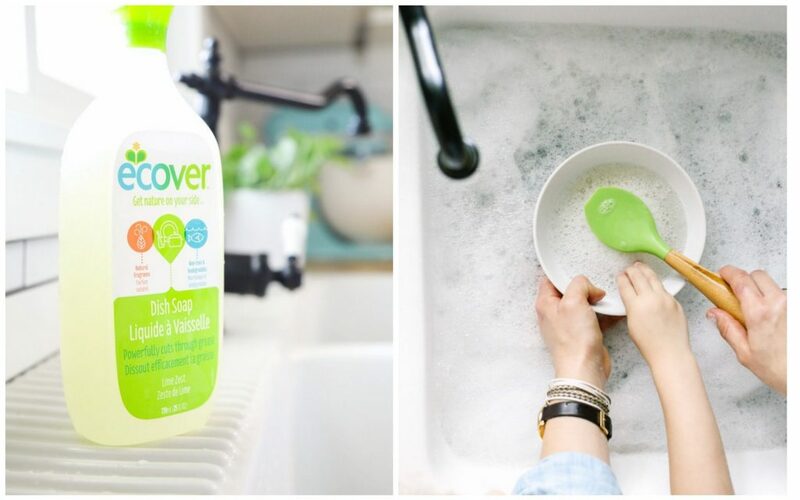 I haven’t yet found a dishwasher soap I’m happy with, so I’m going to give the Ecover a try! I’m so glad the post was helpful, Holly! Let me know what you think of the Ecover. We use Seventh Generation Free and Clear tablets and Ecover rinse aid. I subscribe & save both. Seems like I made good choices! Awesome, Megan! Those are great. 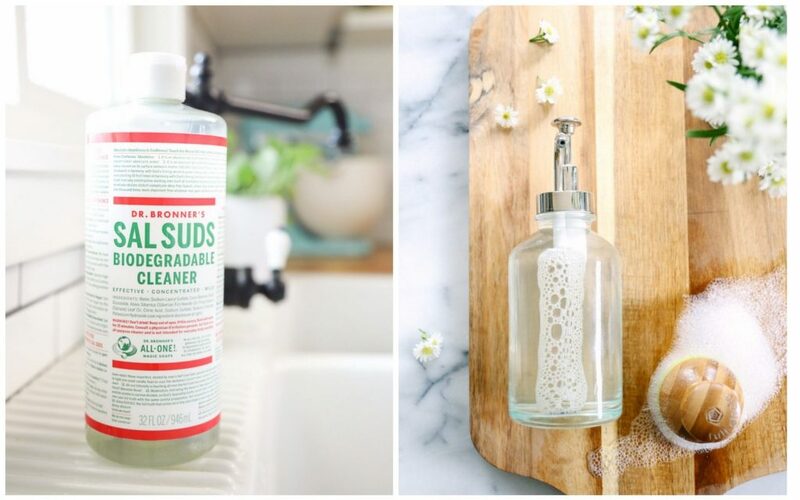 When you make up your own dish soap with Sal Suds + Vinger + water – how do you store it? Hey Reagan, I store it in a soap dispenser by the sink. I live in Switzerland and my mother has been using the ecover dish soap since I can remember. Maybe it once was a different product, made by Held, but now she uses this. When I moved out last year, it was one of the first cleaning products I’ve bought. I also ordered the dishwasher tabs last week, they arrived just this morning. Let’s see how they work. Awesome, Linda. Btw, we were just in Switzerland for Christmas. Beautiful!! Have you ever tried making something with Sals Suds for the dishwasher? I tried making something recently that is not working very well. 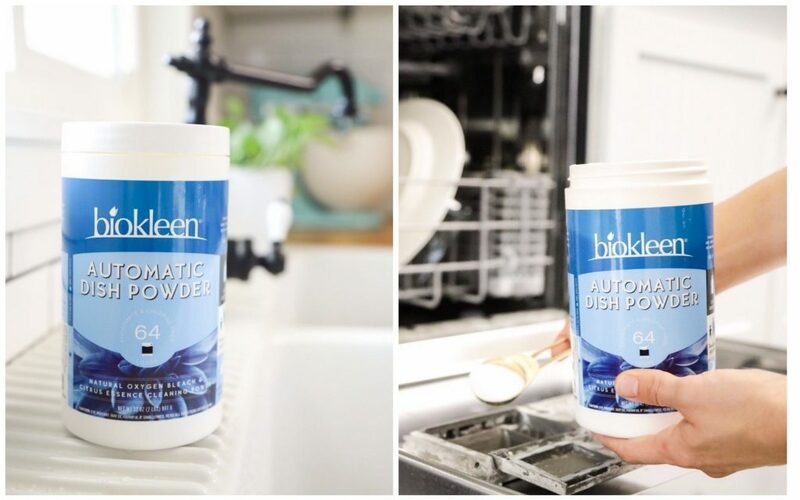 Just curious if you had ever made a product for the dishwasher! Hey Ticia, I find Sal Suds is too sudsy for the dishwasher. I have a dishwasher powder recipe in my cleaning book. I personally use store-bought soap because we have such hard water.